A Filipina food lover writes about food, bento, restaurants, recipes and other food-related topics in between. As a food loving people, Pinoys love having a say in what they eat. And we love getting value for our money. That easily explains why dampa joints, places that let pick and bargain for seafood, meat and veggies, then cook them the way you like it, are so popular. Of course, not everyone loves roughing it in a dampa, with its almost ghetto ambiance. Enter Market Basket in Festival Mall, Alabang. 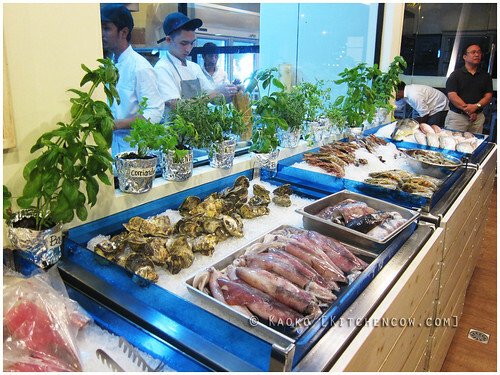 Market Basket takes the dampa premise, picking your own ingredients and getting it cooked your way, then upgrades it into a fancy dining experience. Gone is the muddy, dimly-lit, wet market. Instead, you get to pick your seafood from an iced, open display case. Pots of herbs line the glass windows of the clean, gleaming open kitchen. 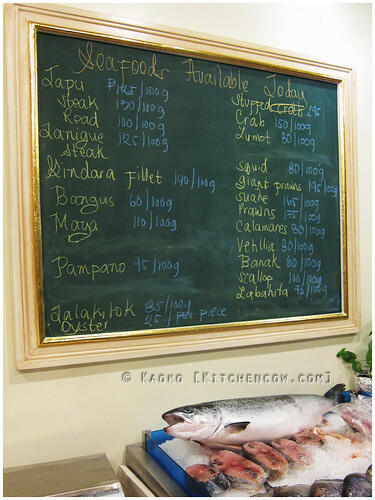 A large chalkboard lists down the day’s catch, along with their corresponding prices. For the less adventurous, a menu offers a selection of ready-to-order dishes. But for the real dampa veterans, a paluto menu lists down a variety of suggested cooking methods, as well as the sauce choices. 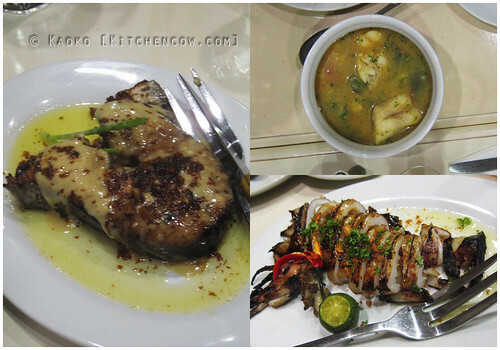 The usual dampa staples are there; think garlic butter sauced seafood, sinigang, inihaw and tempura. But if you’re looking for something more refined, seafood, meat and veggies cooked in classic sauces like the remoulade, berlinoise, and hollandaise sauces are available. I mean, a dampa where I can’t pronounce the dishes without consulting my pocket cooking app? Fancy or what? Now, I’m no dampa newbie. I’ve been eating in them since I was knee-high to a grasshopper (granted, a very large grasshopper). But what I enjoyed about eating at Market Basket was trying dishes we don’t usually order at a dampa. 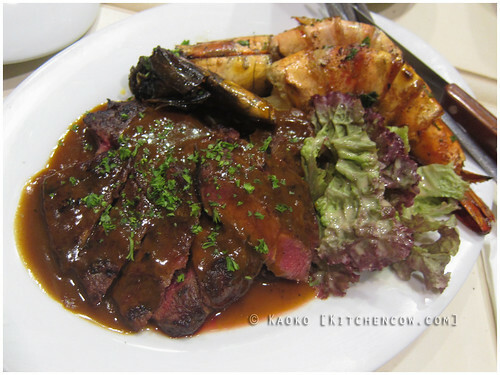 Instead of the usual garlic butter shrimp, we had a fancy surf and turf. 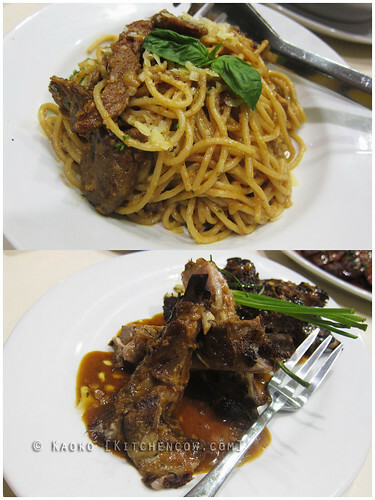 The inihaw na baboy was replaced with a falling from the bone, roasted lamb. Instead of our usual clams cooked in ginger broth, we had a seafood bouillabaisse. 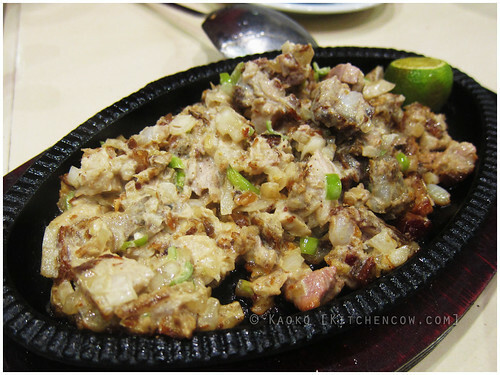 And don’t get me started on the crispy, creamy evil mouthfuls of Lechon Kawali sisig that kept me distracted days after tasting it. 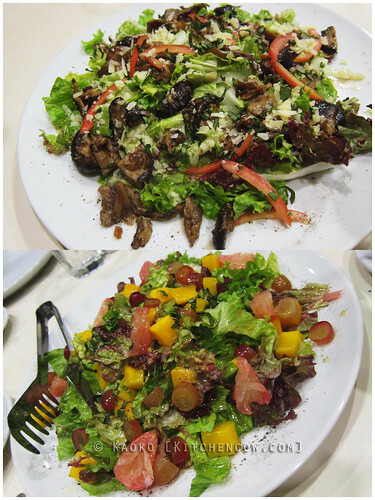 It was a welcome change to our usual dining habits (well, my family’s at least). Of course, if you like the usual fare, that doesn’t disappoint either. Their grilled squid was cooked spot on to the right doneness. The grilled tanigue was moist and flavorful. 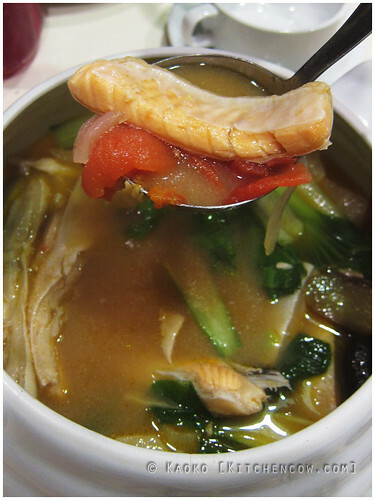 The sinigang broth had a fruity tartness that was great with the buttery salmon belly. Another thing that surprised me was their wide range of desserts. You can end your meal with macarons with salted caramel and nutella, sizzling ice cream (say whut?) 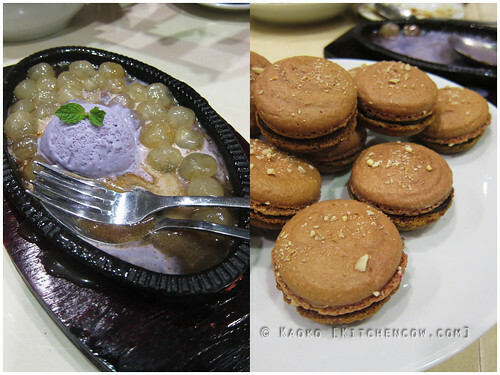 with chewy macapuno balls, and fancy sapin-sapin creme brulee among others. True to the dampa premise, you don’t only get to customize your meal by choosing the ingredients, cooking style and sauces, you also get to control the portion sizes by purchasing the right amount to fit our appetite. Whether you’re looking for an upgrade to the casual dampa experience, or you’re just looking for good eats, Market Basket is a great place to try. The place is clean and relaxing, the food options are bountiful, the service is excellent, and the food is fresh and delicious. A word of warning though: eating here might spoil you from enjoying your usual dampa. Market Basket is located at Unit C3 River Park in Festival Supermall, Alabang. Disclosure: Author was invited to a sponsored dinner to sample the dishes. Opinions are author’s own. No monetary compensation was received. This entry was posted in restos & eateries. Bookmark the permalink. Don't miss another post. Get the latest updates sent to your inbox via FeedBurner. Don't worry, your email address will be safe. We hate SPAM, too! Except the canned meat. Mmmm...SPAM. I love the handwriting of the person who wrote the day’s menu. Looks like an awesome place, and prices seem reasonable too. Far from my side of the metro, but I’m ready to go that far for really good eats. Perhaps they’ll expand eventually? The people behind it are the Uncle Cheffy people, so it’s possible, seeing they’re not newbies to restaurants. We ate there a few days ago, our bill for three people was at 800 pesos. Not bad, really. 800 pesos for three people?!? And including ALL of that?!? Ay, Paolo, not all of these. Most of the photos were taken during a sponsored dinner *points to disclosure statement*. The 800 bill was from when we returned for a meal. Didn’t there use to be a place called Seafood Market or something with branches across Hizon’s in Manila and a giant one in Cuabo that did this concept. They even had supermarket pushcarts. Oh, from your description, that Seafood Market seems grander. I mean, to require supermarket pushcarts and all. This is a smaller set-up, though there’s still a good variety to enjoy. Much like your average dampa, I’d guess? Squierxik on Rehashed Fried Chicken Bento: ???????,??????????! . Furrionhxw on Rehashed Fried Chicken Bento: ???????,??????????! . Squierqhd on Rehashed Fried Chicken Bento: ???????,??????????! . Candyxuj on Rehashed Fried Chicken Bento: ???????,??????????! . Jinky on How to make Arnibal for Sago’t Gulaman: Hi po how to make arnibalsyrup? Areesha Zahid on Best Food Forward 2015: A Quick Preview and Giveaway: This looks and sounds incredible. Kiye Sic on Best Food Forward 2015: A Quick Preview and Giveaway: looks amazing! Copyright Chrissie M. Peria © 2006-2013. All rights reserved. Plus coffee. Lots and lots of coffee.